#2154 "Goat Island Eastern Branch of the Dumoine"
This is the view where the eastern branch of the Dumoine River spills over the last ledge before entering the torrent of the waterfall. Paddlers would also be well advised to stay west of Goat Island. 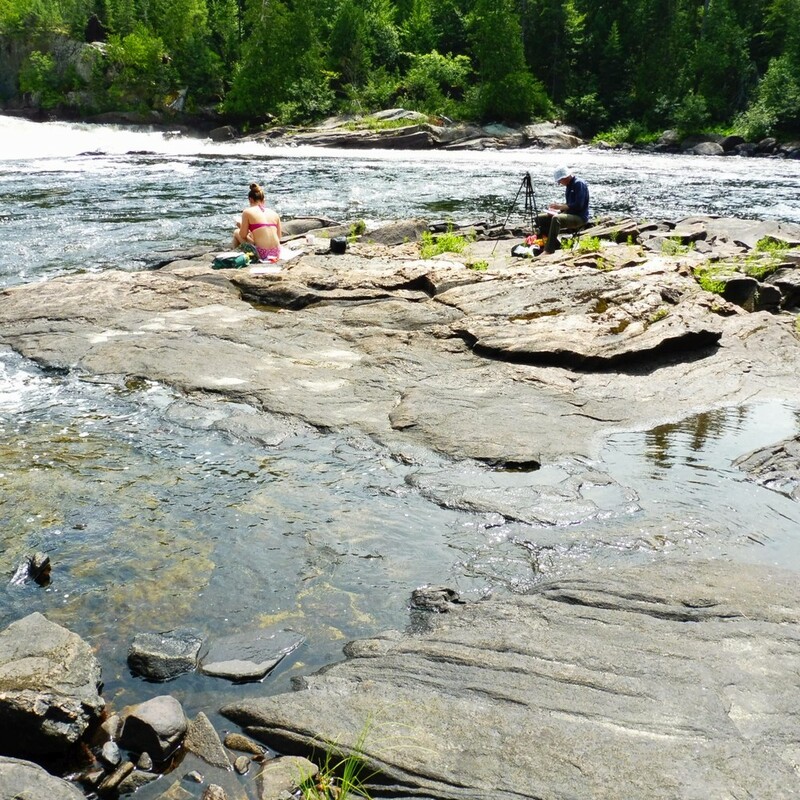 If they took the eastern branch of the Dumoine around goat island there was no option but to take the falls. The fog and mist had lifted into an overcast of low stratus. The tops of the hills to the north were blanketed in cloud. The weather of the previous two days would be reepeated. Apparently Goat Island was so named because early settlers thought that they would like some fresh milk. Goats left on the island would quickly learn that there was no way off and the shepherd would know where to find their livestock. The goat milk did not last for long though. Apparently wolves in the neighbourhood also liked the goats. For this and much more art... click. #2153 "Grande Chute Goat Island"
Mark Patton and I were up and out to the Grande Chute on the Dumoine River very early as was our custom. This was his 47th birthday. No one else was stirring and we were all alone at the bridge. 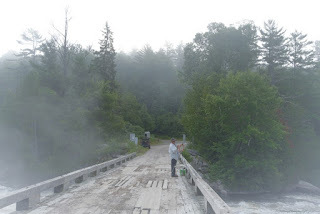 The fog and mist were still very heavy after the overnight rains. This is the view where the Dumoine spills over the last ledge before entering the torrent of the waterfall. 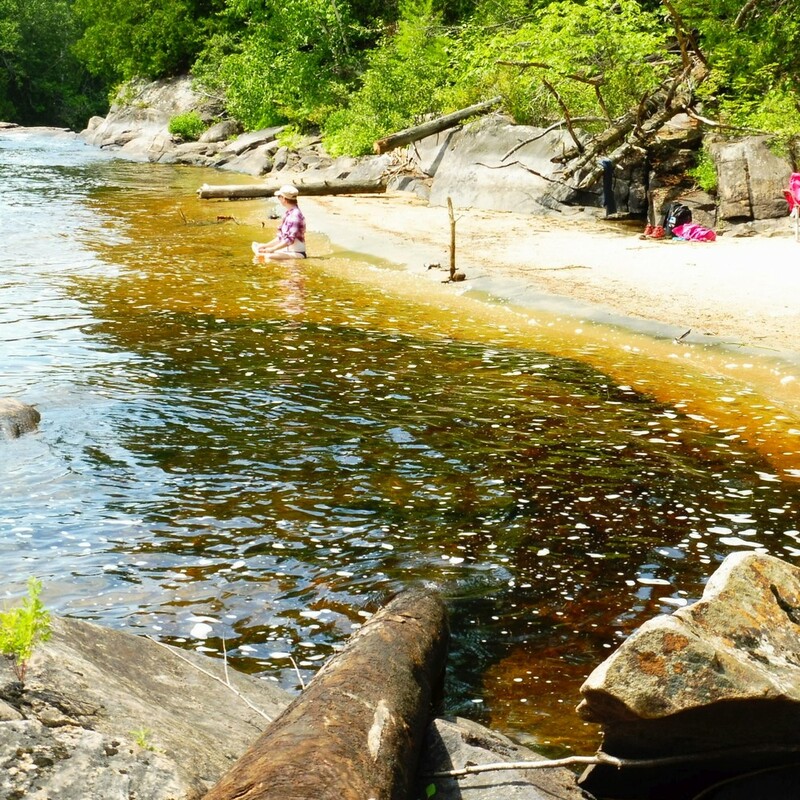 The canoe take out for trippers was on the far west bank between a couple of large rocks on the shoreline. Canoeists would not want to venture beyond that exit. Paddlers would also be well advised to stay west of Goat Island. 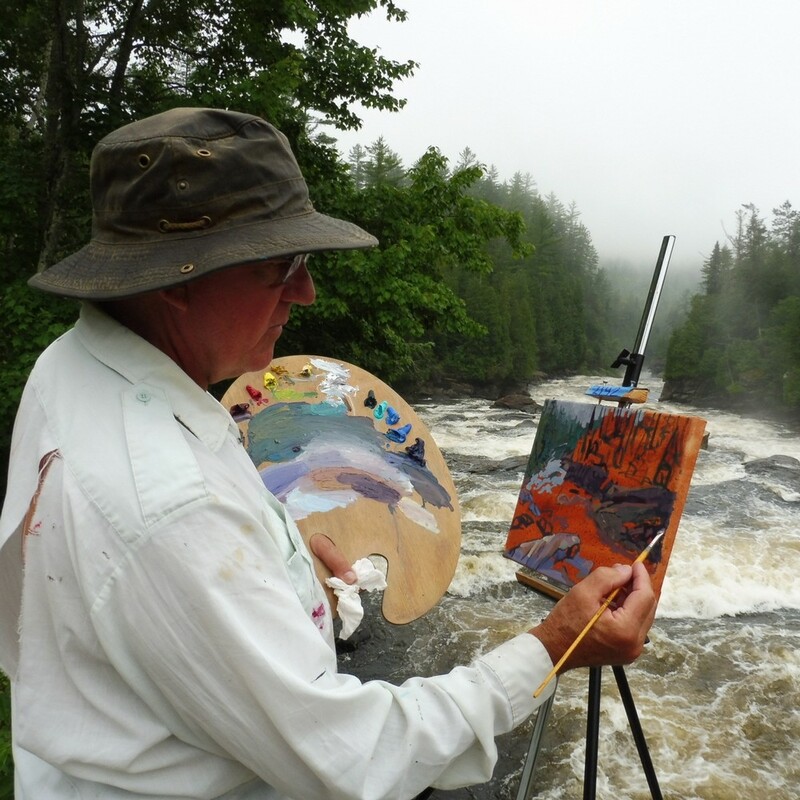 If they took the eastern branch of the Dumoine around Goat Island there was no option but to take the falls. Apparently Goat Island was so named because early settlers thought that they would like some fresh milk. Goats left on the island would quickly learn that there was no way off and the shepherd would know where to find their livestock. The herd of goats and the goat milk supply did not last for long though. Apparently wolves in the neighbourhood also liked the goats. The oils were starting to get a bit stiff but I like the effect on the canvas so I used them anyway. For this and much more art click on the Pixels link below. 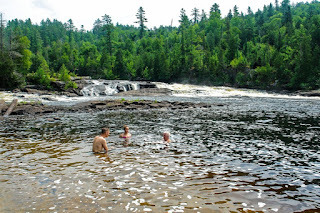 The ledges on the Grande Chute of the Dumoine River were a great place to swim. The bottom was rough with large boulders but the back eddy spilled a constant flow of water over you if you hung on to the rocks on the edge of the current. 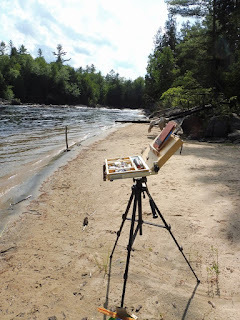 I wanted to record the place and maybe capture some of the fun I enjoyed painting and swimming in that pool. The air mass was still hot and humid as one would expect with the southwesterly flow right off the Gulf of Mexico. 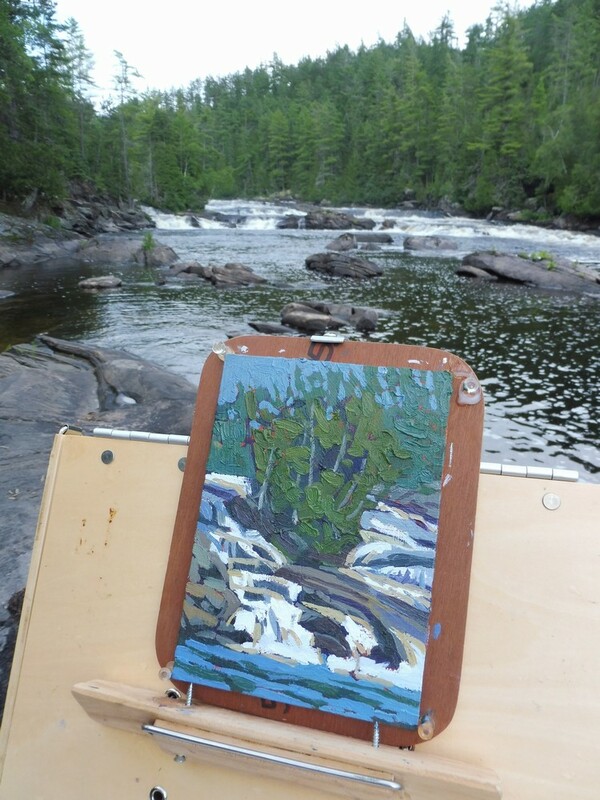 There was a little rocky island that separated the Dumoine rapids into two branches. The trees on this island would be in grave danger during the spring run-off. It was surprising that there was anything rooted to this hunk of Canadian Shield rock. 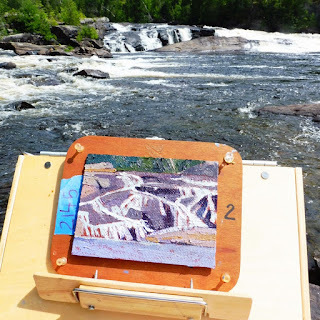 The paired paintings of #2150 "Grande Chute Ledge Torrent" and #2151 "Grande Chute Cataract" required a third in order to keep them in balance. That was the intent to paint this view of the rocky island. The thunderstorms developed as expected. Mark and I got very wet but it did not matter much as we were wet from swimming anyway. All of our gear got very wet as well. The lightning got within a few kilometres but the heavier thunderstorms remained well to the south. 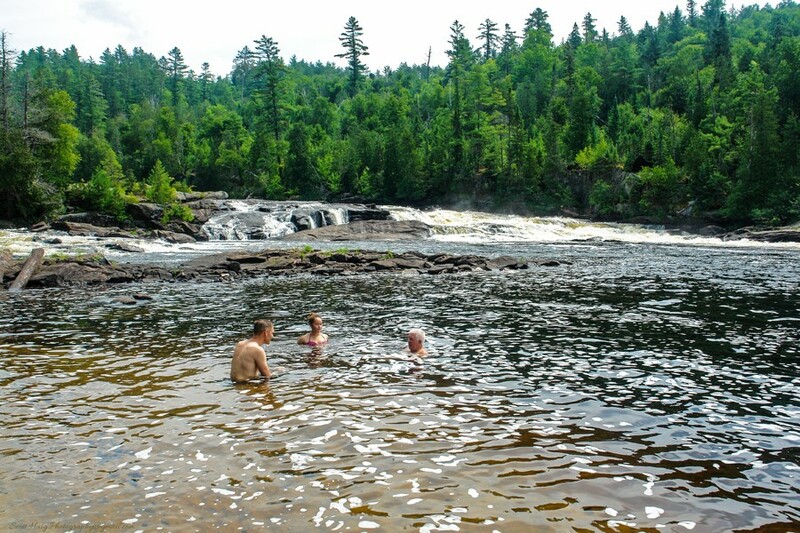 The ledges on the Grande Chute of the Dumoine River were a great place to swim. The bottom was rough with large boulders but the back eddy spilled a constant flow of water over you if you hung on to the rocks on the edge of the current. 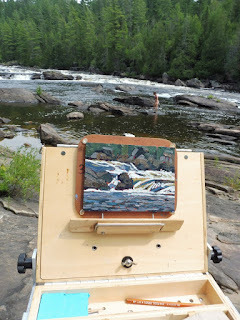 I wanted to record the place and maybe capture some of the fun I enjoyed painting and swimming in that pool. The summer air mass was still hot and humid as one would expect with the southwesterly flow right off the Gulf of Mexico - a water vapour plume is what the pattern can be called. This painting was intended as a partner to #2150 "Grande Chute Ledge Torrent". I tried to catch the energy in the rapids. There is emotion in the motion and the commotion of fast moving water. The smooth panels require that you mix the correct colour, lay it in and leave it alone. If one tries to go back in to polish the brush stroke or maybe correct a tone or colour, the rocks would quickly turn into mud. It was better to just plunge into the scene. 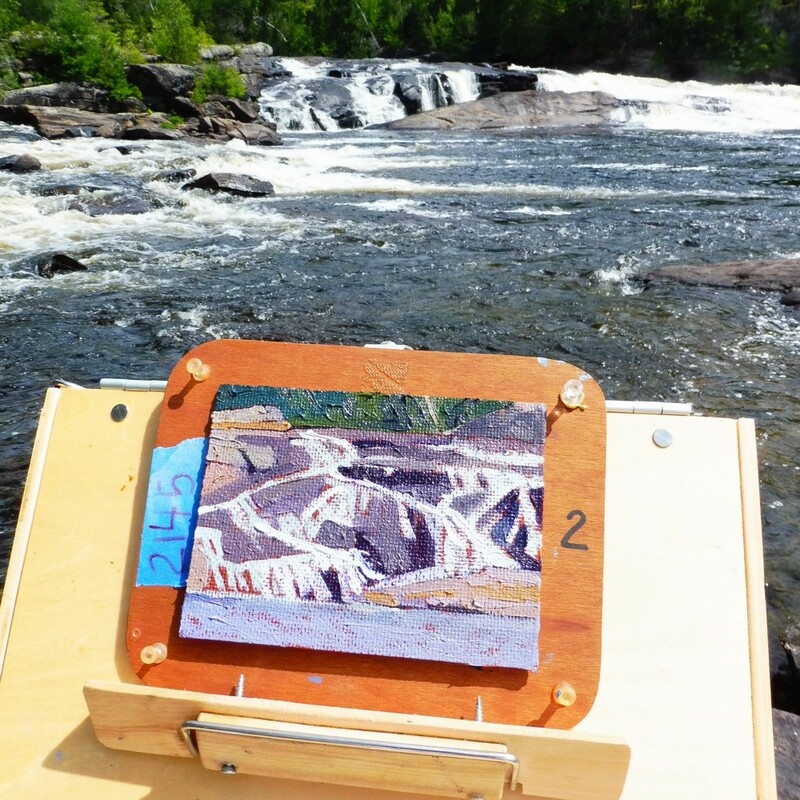 The paired paintings of #2150 "Grande Chute Ledge Torrent" and #2151 "Grande Chute Cataract" required a third in order to keep them in balance. That was the intent of painting #2152 "Grande Chute Waterfall". For this and much more art click on the Pixels link below.and enjoy the moment. #2150 "Grande Chute Ledge Torrent"
The ledges on the Grande Chute were a great place to swim. The bottom was rough with large boulders but the back eddy spilled a constant flow of water over you if you hung on to the rocks on the edge of the current. 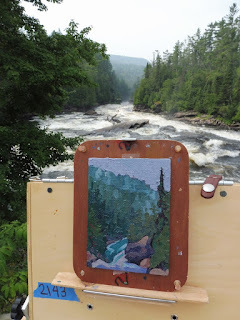 I wanted to record the place and maybe capture some of the fun I enjoyed painting and swimming in that pool. The air mass was still hot and humid as one would expect with the southwesterly conveyor belt flow right off the Gulf of Mexico. Thunderstorms were again on the overnight menu. This painting was intended as a partner to #2151 "Grande Chute Cataract". The smooth panels require that you mix the correct colour, lay it in and leave it alone. If one tries to go back in to polish the brush stroke or maybe correct a tone or colour, the rocks would quickly turn into mud. It was better to just dive into the scene and enjoy the moment. I moved down to the ledges on the east bank of the Grande Chute. I was actually getting tired of standing so I sat on the rock as close to the edge as I dared. A tumble into the torrent would be the last mistake anyone could make. 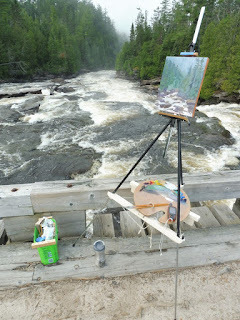 The roar of the cataract was deafening and I hoped that the sound would permeate the canvas. Plus it felt really good to just sit down for a while. 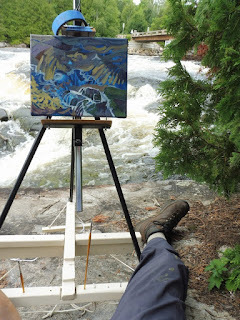 I wanted to capture the energy of the cataract with equally energetic brush strokes even though I was sitting down on the job. The Pixels image below links to this painting and much more. #2148 "Mist of the Dumoine Grande Chute"
The fog had lifted and I could see further down the Grande Chute of the Dumoine River. There was still some mist limiting the visibility. The light was changing quickly but I locked in the colours with my first brush strokes. 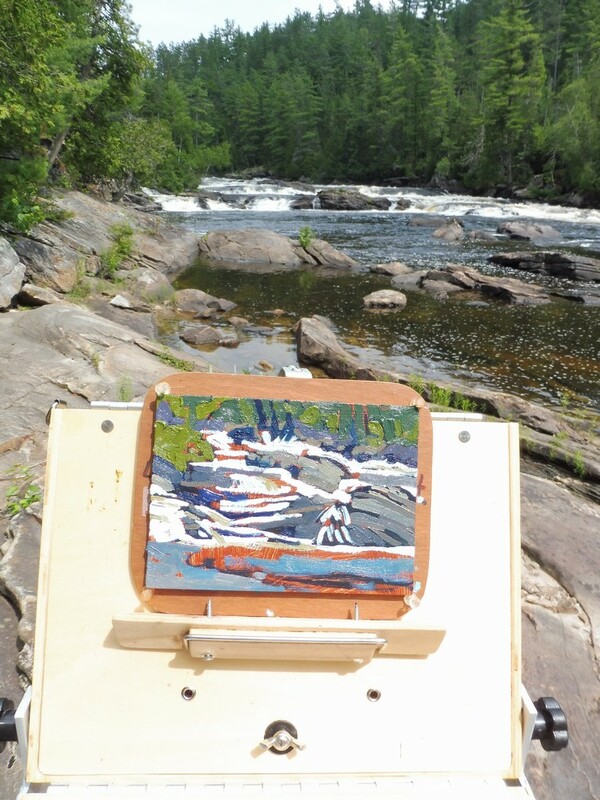 I had moved a bit further to the east along the bridge after painting #2147 "Dumoine Grande Chute Mist" and could now see Serpent Rock in the valley of the Dumoine Dinosaurs. The eastern bank of the Grande Chute was always dark in the morning. 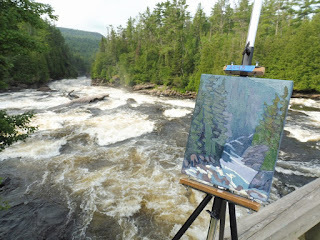 I did paint what I saw and those works tend to be dark and moody along the deep valley of the Dumoine. The colours of the forest respond to the light. Painting is always about the light even in the dark. #2147 "Dumoine Grande Chute Mist"
Mark Patton and I headed out early to the bridge over the Grande Chute. The overnight rain combined with the southwesterly flow of heat and moisture were perfect conditions for morning fog and mist. These moody lighting effects were not to be missed. I set up on the middle of the bridge and got lost in the zone. You cannot hear any vehicles approaching over the bridge. The first indication of a car is the trembling in the planking. People were very polite and never used their horns. We did try to stay out of the way though. 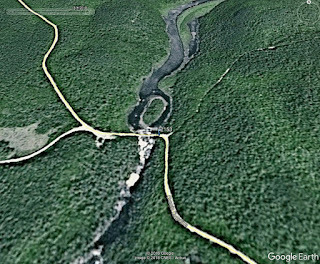 The viewing angle hides the head of the Dumoine Dinosaur or the serpent at the favourite swimming hole. The water was quite dark like tea and turned into a mocha froth when the water was tumbled over the rocks of La Grande Chute. I tried to capture the energy and the colours. There is intended to be motion in the commotion. Dark water can make diving dangerous as the visibility is greatly reduced. I kept my head above the froth. #2146 "Elephant in the Sky"
The Elephant in the Room is an English-language metaphorical idiom for an obvious problem or risk that no one wants to discuss. 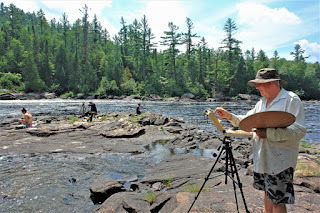 We were having such a great time painting and swimming at the sandy pool on the Dumoine. The cumulus cloud was the elephant in the room but it also bore a striking resemblance to Dumbo the Flying Elephant. These developing cumulus were telling the weather story of a very unstable air mass and a moderate southwesterly flow conveying both heat and moisture over the Dumoine. The thunderstorms of Wednesday night were about to be repeated using the abundant energy stored in the atmosphere. Of course we did not wish to talk about the impending lightning and thunder as we wanted to keep painting and swimming. I used a lot of paint on this slippery smooth panel. The thunderstorms developed but painting en plein air means you are also likely to get wet sometimes. We got soaked and it was not from just swimming. Mark and I were the very last to leave the pool by a few hours. Without any lunch we were looking forward to having supper. I liked the way that the water tumbled over this particular granite ledge. 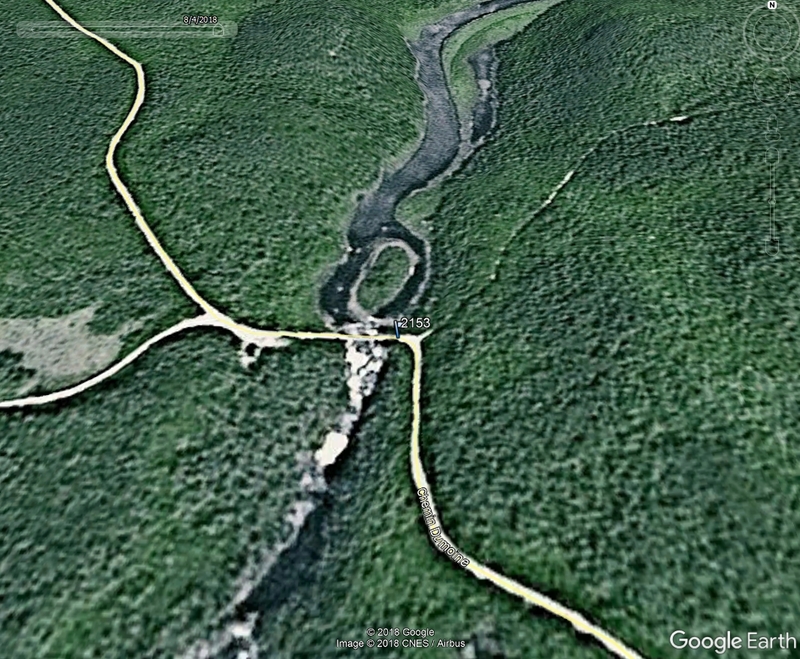 Most of the Dumoine roared through the main channel just to the east of this trickle. The water followed a zig zag route down the granite rock face. There are patterns everywhere in nature if we only slow down to look. 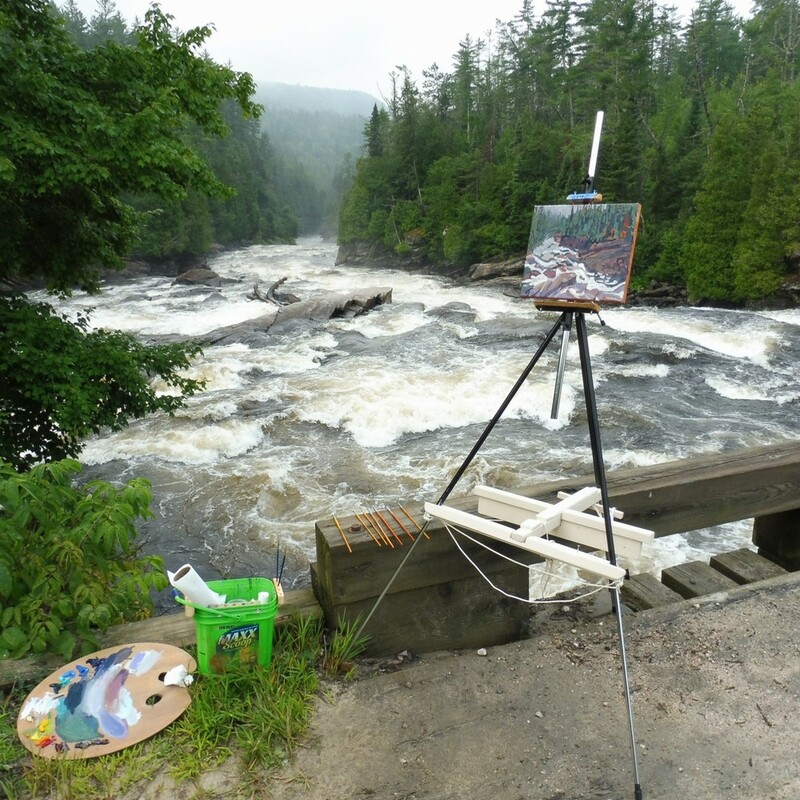 This is intended as the partner to #2144 "Downstream from the Grande Chute Ledges". The day was hot and humid under the strong August sun. I walked back to the car to retrieve the sun screen that had fallen out of my art bucket into the trunk of the car. We needed that sun screen. I swam several times to cool off between strokes of paint on this panel. Mark and Olivia were painting at the pool as well. Scott and Cynthia came for a swim too. 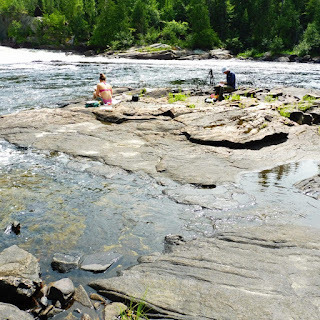 It was like a Dumoine pool party on the edge of the rapids. These little rough panels are really hard on the brushes. They are fun though. #2144 "Downstream from the Grande Chute Ledges"
The Dumoine fog and mist from the morning had burnt off. The unstable air mass was promising more thunderstorms for later in the day. Persistence can be a good forecast technique. Thunderstorms occurred the previous few nights and were likely to happen again as the same large and moist air mass persisted over the region. I headed downstream to find the Ledges further south on the Grande Chute of the Dumoine. 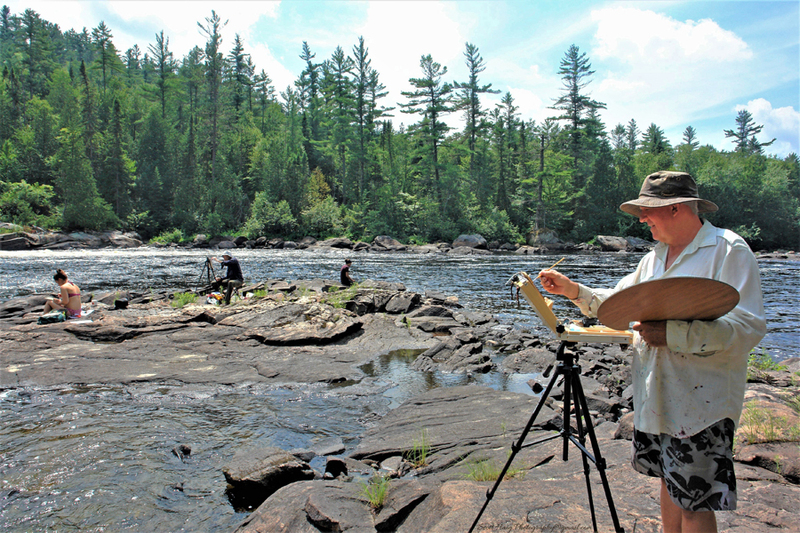 Becky Mason had told me she was going to paint there and the buddy system of the DRAW Camp required someone nearby. Somehow I didn't see Becky and instead went to the sandy pool just downstream from the rocky pool known as the Ledges. Not wanting to squander any painting time I set up with a small rough panel to try to capture the energy in the water fall. It was hot so I also went swimming. This small rough panel almost looks like an abstraction but it was inspired and nurtured by real nature. #2143 "Serpent Rock on the Dumoine"
The mist over the Dumoine had almost lifted. The moisture from the overnight rain had been converted to overcast stratus. The lighting was great for another view from the bridge over the Grande Chute. The characteristic rock outcrop in the lower centre of this painting marked the upstream side of an excellent swimming pool. Becky Mason thought that the middle portion of the outcrop looked like the head of a plant eating dinosaur. The megalosaurus was a meat eating predator but seemed appropriate as well.. The megalosaurus was discovered in England and was the first dinosaur to be named. Surgeon and geologist James Parkinson identified some fossilized remains as being from a reptile. He named it 'Megalosaurus', which means 'great lizard'. This was in 1824 almost twenty years before Sir Richard Owen invented the word 'dinosaur'. Megalosaurus was around 9 metres (30 ft) in length and weighed around 1 metric tonne. It stood on two legs and was a predator. It lived in the middle Jurassic Period. 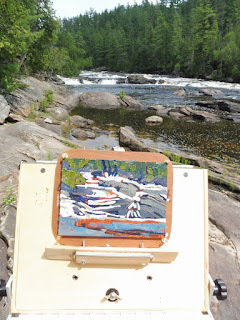 Becky Mason and I swam there after this painting was completed. Becky could hear the peregrine falcons but my ears could no longer hear that high pitched sound. The rocky cliffs were perfect habitat for the peregrines. #2142 "Grande Chute Morning Light"
The fog had transformed into mist so I headed up to the bridge that spanned the Grande Chute. 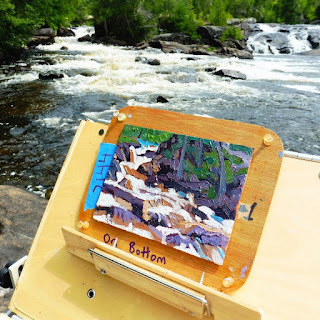 I could see further and that encouraged a painting looking down the length of the falls across the swimming holes that I had frequented in 2017. 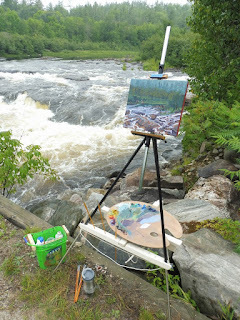 I hoped that the motion and energy in the rapids would find its way on to the canvas. 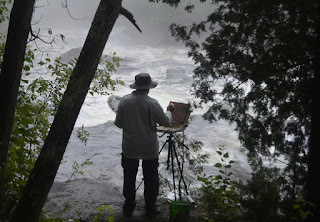 I got in the zone and had no idea how those pictures of me painting got on to my own camera. Maybe my friend the bear took them? The rip in my thirty year old painting shirt was starting to grow. The story about the black bear ripping my shirt after we got into a discussion about my use of burnt umber was greatly exaggerated. 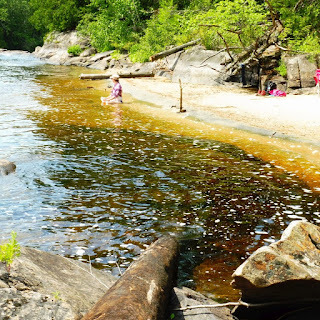 I included all of the details of the rocky point upstream from the favourite swimming hole. This characteristic rock is in the upper left of the painting. The second ledge up from the water on that rocky point looked like the head of a vegetarian dinosaur when viewed from the swimming hole. Becky Mason named that Serpent Rock and that was good enough for me. Even though the flow of the Dumoine was near its annual minimum there was still a lot of water and noise associated with the torrent. Becky Mason came by looking for her husband Reid McLachlan. I last saw Reid crossing the bridge and heading down the trail along the west bank of the Dumoine. Becky had his lunch but she was not concerned. They both know there way around the Canadian wilderness. Becky and Reid shared some terrific dried oranges with the CPAWS group. Those dried treats were very special and would be the highlight of any food pack for sure. 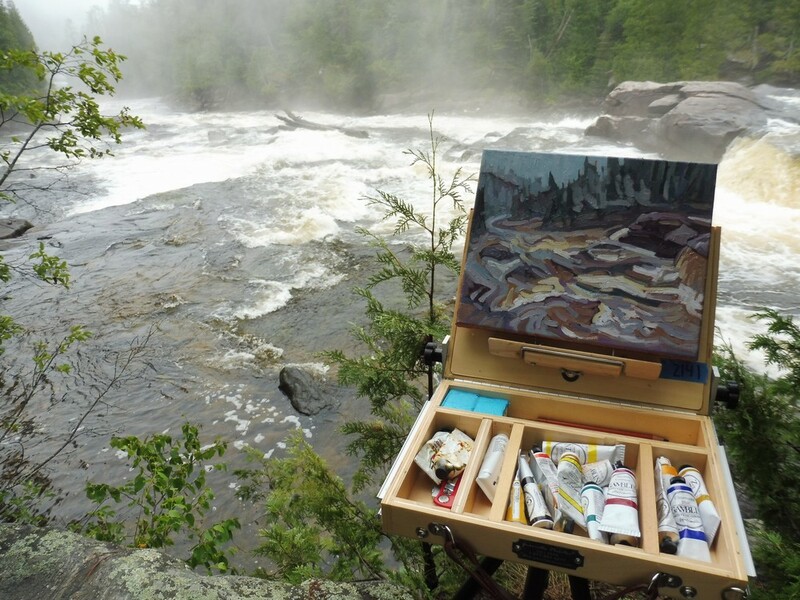 #2141 "Dumoine Grande Chute Foggy Morning"
My friend, artist Mark Patton and I headed to the Grande Chute after a quick DRAW coffee and a couple of slices of CPAWS toast. Delicious. There were very few people stirring and the morning light was changing fast. 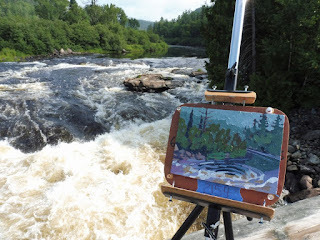 Mark was keen to get painting and so was I. I set up at the same place where I painted #1959 "Morning on the Grande Chute" in 2017 on the very edge of the east bank of the Grande Chute. The roar of the rapids drowned everything else out. The morning fog from the overnight rain was still thick. The Dumoine valley was deep and dark and full of noise. I painted what I saw and heard. There was meant to be a lot of motion amid all of this commotion. 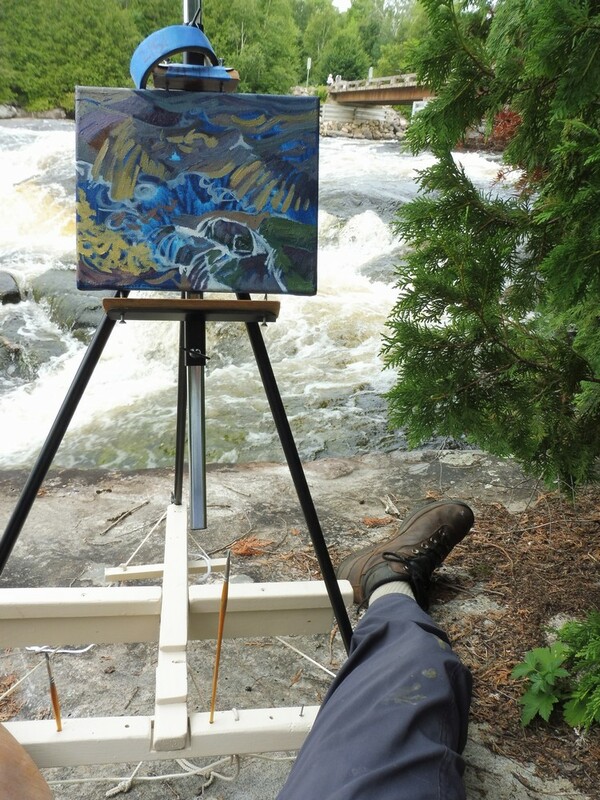 The oils flowed and I did not even realize that my friend artist Reid McLachlan had taken any pictures of me while I painted. It was too much fun to be painting with these friends!